February 15, 2017|Posted in: Let's Eat! These are my hubby’s all time, every time, one of a kind, favorite cookies! He always wants them for his birthday, Christmas, and Valentine’s Day and he’d love them just as much the other 362 days of the year as well!! His mama used to make them for him when he was a little boy. When we got married he said we needed to get the recipe. 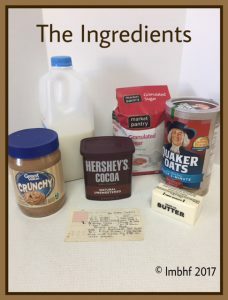 I have a wrinkled, splashed on, and stained recipe card that she gave to me in her kitchen over 30 years ago, so I could copy down her recipe. 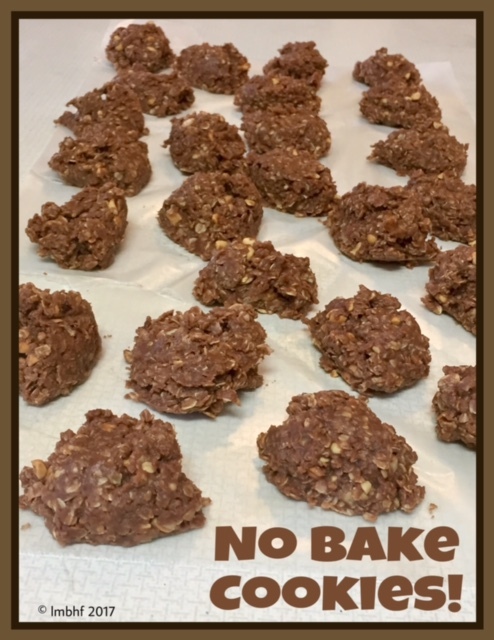 No doubt there is a No Bake Lover in your family too! You can make a batch of them for the fam and find out!! In a medium size mixing bowl, add the Instant Oatmeal, Peanut Butter and Pure Vanilla Extract, set aside. 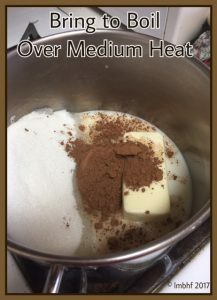 In a medium saucepan, stir together the sugar, milk, butter and cocoa. Bring to boil over a medium heat, stirring constantly, until mixture reaches 215 degrees. 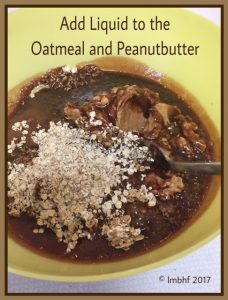 Add the boiling liquid to the Oatmeal and Peanut Butter and mix well. Drop by heaping teaspoonful onto wax paper and allow to cool for 30 minutes. Serve them to the family and watch them disappear! I have to just pick up some instant oatmeal as we only have steel cut oats on hand. I think my girls will like these. These look great! I’ll have to try them! Thanks for sharing with the Homestead Blog Hop! Oh my goodness, I absolutely love these. A co-worker used to bring me some every now and then. Thank you Lori for sharing this post at the #WednesdayAIM #LinkUp #BlogParty. I shared it on my social media sites. These no bake chocolate cookies are a classic cookie around our house. Kids always enjoyed helping to make them. Thanks for linking up with Blogging Grandmothers. Again, oh my goodness, I absolutely love these. A co-worker used to bring me some every now and then. Thanks Lori from Grammy Dee, #BloggingGrandmothers #LinkUp #BlogParty, social media shared. « A Love Story Begins . . .